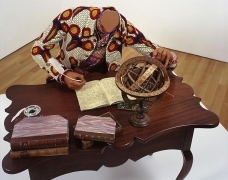 James Cohan Gallery is pleased to present an exhibition of work by Yinka Shonibare, MBE. This will be the second exhibition in the gallery's Shanghai space since its opening in July 2008. In this exhibition, Shonibare's photographs and sculptures dating from 2005 through 2008 address the colonialist impulse and the struggles with power and identity that result from it. On view will be the photograph, La Méduse (2008),which recalls the French ship that was wrecked off of the coast of Senegal in 1819 as it was on its way to retake possession of the African land from the British. 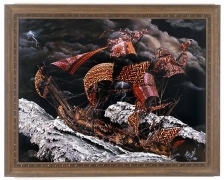 Shonibare's ship is depicted in the moment just before its demise, and the artist uses the frigate's precarious state to hint at the world's present vulnerabilities. Also presented will be the 2008 series The Sleep of Reason Produces Monsters. The five richly-hued photographs are based on Francisco de Goya y Lucientes's etching of the same name. Shonibare has reworked Goya's original warning against irrational behavior and expanded its reach, depicting figures who together represent five of the world's continents. Each figure is outfitted in Victorian-style garments made from what we have come to recognize as African textiles—in fact, cloth that was originally imported by the Dutch to Africa but which has become so closely associated with the continent that it is assumed to be indigenous. Accompanying the photos will be Immanuel Kant (2008), sculpted after the Age of Enlightenment philosopher and presented with amputated legs - a fictional disability suggesting that intelligence can be a hindrance when it creates a damaging thirst for conquest. 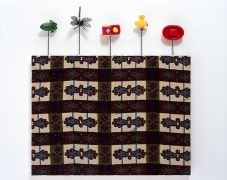 Earlier works by Shonibare will include Eleanor Hewitt (2005), a sculpture of the American collector born in the 19th century who is playfully perched atop stilts to indicate her elevated taste and adventurous spirit, as well as several of Shonibare's Toy Paintings from his 2005 series. Also shown will be the film Odile and Odette (2005), in which two ballerinas - one black , one white - dance the Swan Lake roles, separated by a mirror to indicate the interplay between reality and reflection, conscious and unconscious. Yinka Shonibare, MBE (b.1962) is a painter, photographer, filmmaker, and installation artist whose work is influenced by the culture of Nigeria, where he grew up, and England, where he studied and now lives. Shonibare's recent solo exhibitions include The Hayward Flag Project (2007, The Hayward Gallery, London), Le jardin d'amour (2007, Musée de quai Branly, Paris), and Scratch the Surface (2007, National Gallery, London). 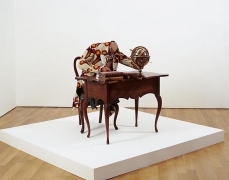 He is the subject of a mid-career retrospective at the Museum of Contemporary Art in Sydney, Australia (September 2008), traveling to the Brooklyn Museum, New York, and the National Museum of African Art, Smithsonian Institution, Washington, D.C., in 2009.. The artist was shortlisted for the prestigious Turner Prize in 2004, and he was awarded the title of Member of the British Empire in 2005. 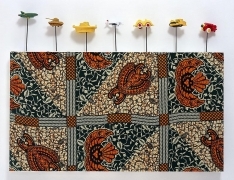 His work was included in the African pavilion at the 52nd Venice Biennale in 2007. The artist's proposal for the Fourth Plinth in London's Trafalgar Square was recently selected as one of two public works to be realized on the site.